Congratulations are in order! 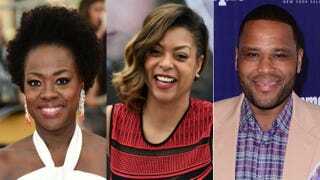 More than a dozen black actors and actresses picked up Primetime Emmy Award nominations, Variety reports, and six appear in lead actor or actress categories. It's further confirmation that black actors were not sidelined in supporting roles but were thrust to the forefront of television this past year. Wednesday night was dominated by Empire, and Thursday night by How to Get Away With Murder, so it's only fitting that the two actresses who carry those shows—Taraji P. Henson and Viola Davis respectively—snagged nominations in the Lead Actress in a Drama category. Cicely Tyson's brief appearance as Davis' mother earned her a nomination in the Guest Actress in a Drama category. Khandi Alexander's performance as Olivia Pope's mother in Scandal also earned her a nomination in that category. David Oyelowo was nominated for Lead Actor in a Limited Series or Movie for his performance in the HBO movie Nightingale, in which he played a war veteran in distress. Queen Latifah's performance in another HBO movie, Bessie, received rave reviews and earned her a nomination in the Lead Actress in a Limited Series or Movie category. And two nominations—Anthony Anderson and Don Cheadle for Black-ish and House of Lies, respectively—are pitting those guys against each other for Lead Actor in a Comedy. Regina King (American Crime), Angela Bassett (American Horror Story: Freak Show) and Mo'Nique (Bessie) are all nominated in the Supporting Actress in a Limited Series or Movie category. The entire ensemble cast of Orange Is the New Black was recognized with the show's nomination for Outstanding Drama Series, but Uzo Aduba is the only black actress from the series to be nominated individually for Supporting Actress in a Drama. Other black nominees include Reg E. Cathey from House of Cards, as Guest Actor in a Drama, and Andre Braugher from Brooklyn Nine-Nine, Keegan-Michael Key from Key & Peele and Tituss Burgess from Unbreakable Kimmy Schmidt, all in the Best Actor in a Comedy category. Take a look at the full list of nominees over at Variety. Kudos to all the actors and actresses, and for the way African-American thespians have dominated television this past year.